Asian Tea & Exports is engaged in domestic trade and exports of different types of Rice from India to many countries in Africa like Benin, Mozambique, Tanzania and Middle east countries like UAE, Iran, Iraq, etc. The company exports Parboiled, Steamed and Raw Rice, of different grain sizes and long grain from various Rice growing regions of India, like Bengal, Chhattisgarh, Madhya Pradesh, Andhra Pradesh, Haryana, Punjab, etc. The company’s registered brand “Mom’s Delight” is popular in African countries. Before packaging, we ensure that every grain is fully grown and efficiently processed. 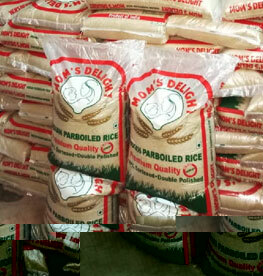 Besides, it also sources and participates in tender for supply of Rice to Government agencies. Asian Tea & Exports is also engaged in the business of domestic and international trade of various foodstuff products like raw cashew nuts, sugar, soyabean, sesame seed, spices etc. Detailed specifications and prices can be provided on request.